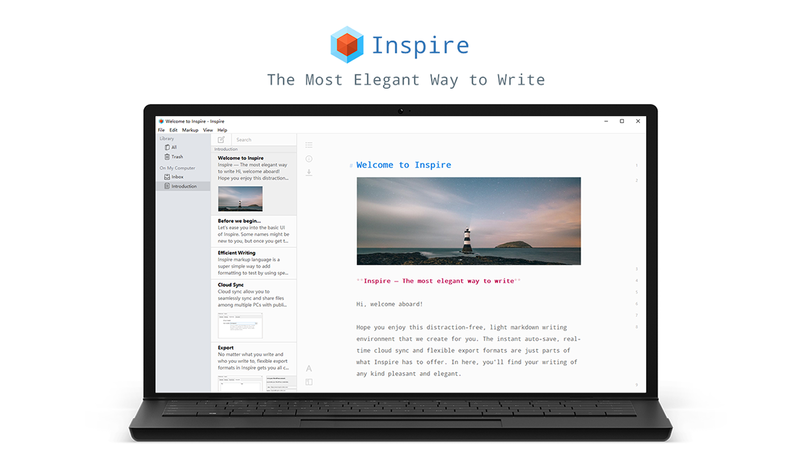 Inspire creates a distraction-free, light markdown writing environment that boosts your productivity. From quick notes to blog posts to great novels, you focus on the content, and Inspire helps with the rest. Instant auto-save, real-time cloud sync and flexible export formats make your writing of any kind pleasant and elegant. Do you sometimes struggle with distractions? Do you feel disturbed by countless menus? Are you tired of dealing with files and folders? Why not give a go at Markdown. Why use Markdown, you ask? Remember how many times you find yourself get distracted from the WYSIWYG editor such as Word? Because all the styles and formats are vying for your attention. Inspire is designed for maximum productivity. The distraction-free, light, clean interface allows you to focus on your writing. It creates a writing environment where your attention will have no rival: You writing on Inspire is the only thing left to do. The markup shortcuts with syntax highlighting give you an immersive experience without giving away readability. Different from other editors, you’ll have no problem read what you write on Inspire even when you have zero idea about HTML. This all attributes to the highlight syntax on Inspire. Markup based editor and full keyboard support allow you to say goodbye to the mouse. No more a click-click here, and a click-click there. When you’re wiring on Inspire, your mouse won’t be quite necessary. Auto-save and automatic backup so you won’t need to worry about losing any of your work. You don’t need to hit save every 5 minutes, worrying that all your work will go down the drain when you forget to do so. Dark Mode (theme) makes it easier to stay focused on your work at night. Packed with typography, the flexible multi-format export feature makes your writings look great everywhere. You can export your work to PDF, Word, HTML, and even publish it directly onto a WordPress site with just several clicks. And not have to worry about messed-up format after the export. Because this is how powerful Markdown is. Sync groups and sheets among multiple PCs via cloud syncing services such as Dropbox, OneDrive and Google Drive seamlessly. So you can work anywhere and have your work sync in real time.